Host Hotel: Best Western, Staunton, VA 92 Rowe Road, Staunton, VA 24401 Phone: (540) 885-1112. Located of Exit 222 from Route 81. Call to reserve, and mention SPOOM Mid-Atlantic when you register, to get the preferred rate of $98.00 per night, plus 9.3% taxes. Ten rooms with 2 double beds and Five rooms with a king-sized bed are being held for April 11 & 12 - until March 18, 2019, then they will go back into their system, at regular rates. All rooms are non-smoking. Deluxe Continental Breakfast is included. Evening Meet and Greet Dinner: 6 pm at Mrs. Rowe’s Restaurant, 74 Rowe Road, Staunton, VA 24401 (next to the Best Western), 540-886-1833. Described as Down-Home Southern Cooking, we have reserved a small dining room for SPOOM-MA members, with separate checks. 9 AM to 11:00 AM: Wades Mill, 55 Kennedy Wade’s Mill Loop, Raphine, VA 24472 (https://www.wadesmill.com/). Formerly Kennedy-Wades Mill, a fully functioning commercial grist mill opened for a behind-the scenes tour and grinding just for our members. View a special exhibit of display boards provided by the nearby Brownsburg Museum, about Milling and Distilling in the Shenandoah Valley. 11:00 to 12:00 Lunch: Box lunches at Wades Mill before bus departure. 12:00 to 1:00: Bus ride to Frontier Culture Museum of VA, 1290 Richmond Road, Staunton, VA 24401, passing or stopping by roadside mills on the way. The Frontier Culture Museum of Virginia tells the story of the thousands of people who migrated to Colonial America, and of the life they created here for themselves and their descendants. It is a complex of historical buildings, brought from foreign countries and reassembled on this renowned outdoor museum’s grounds. We have arranged for a customized tour of colonial material culture, architecture and food production practices, including a quern mill demonstration by re-enactors / interpreters. 3 to 4 hours tour, on jitney buses and golf-carts. This is a one-third-off discounted ticket, just for SPOOM MA attendees. 5:00 to 5:30 pm: Return to Best Western Inn, Staunton. Dinner on your own; select from many restaurants in Staunton, including the Mill Street Grill, 1 Mill Street, Staunton, VA, 24401 (in a renovated mill). http://www.millstreetgrill.com and Osceola Mill Restaurant, 352 Tye River Turnpike, Steele's Tavern, Virginia 24476; Phone: 540-377-6455 osceolamill@gmail.com. ***Friday Tour Cost of $44 includes transportation, driver gratuity, tour fees, and lunch. Register for bus tour by April 1, 2019. Breakfast at the hotel or another choice in the area. Check out of the Best Western Inn at 8:00 to 8:15. 9:00 AM: Drive on your own to Cyrus McCormick Farm / Shenandoah Valley Agricultural Research & Extension, 128 Cyrus McCormick Circle, Raphine, VA 24472 (540) 377-2255. 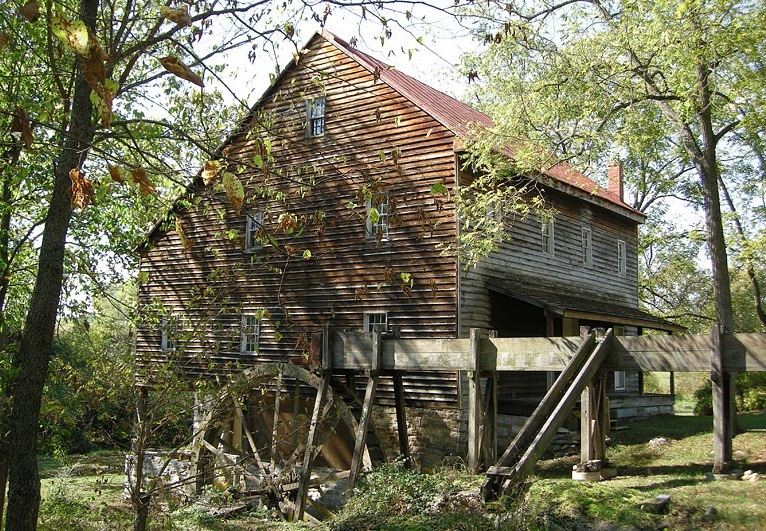 9:30 AM: Tour and grinding demonstration at Cyrus McCormick Farm Mill, by Glenn Wilson, Miller and lifelong resident of the Shenandoah Valley. Afterward, the semi-annual Chapter Meeting will take place in the McCormick Farm Barn (unheated). The meeting will be followed by a catered hot lunch buffet of Chicken on the Bone, Meatloaf and 2 vegetable side dishes, also in the Barn. Afterward, attendees are welcome to take the self-guided tour of the 600 Acre, Cyrus McCormick beef and dairy farm, operated by Virginia Tech University. ***Saturday Cost of $25.00 includes grinding demonstration, meeting, lunch, and farm tour. Download, complete and mail Registration Form to pay by check or continue below to pay online using PayPal.